Question: How can you avoid the slippery slope of debt? See the answer at the end of the blog. Anna is a twenty-nine year old of Irish-American decent with an athletic build and great smile. She works for a disability company selling policies door-to-door and has a part-time job working at the nearby mall. She feels as if she is working around the clock, and barely keeping her financial head above water. Her goal is to be able to enjoy her two young and lively daughters. A couple of years ago, Anna went through a divorce and now she has to work in a job that provides her financial security and flexibility so she can handle the role as a single mom. Anna met the author in a suburb of Detroit, while he was giving a Wealth In A Decadeworkshop. She attended the workshop and purchased the book. A couple of months later, he received a letter from her explaining that she needed some help relating a financial plan to her situation. “The company had a plan that for every dollar I put into my 401k, they would match 50 cents BEFORE taxes” For $200 a month, she saved about $5,000 of her annual gross income of $36,000. The author sent her a set of cards and a week later they played The Corporate Guide to Profit & Wealth over the telephone. To begin, she selected the Yourself/Your Family scope card. The problem card she selected was No(Small)Profit, Value or Savings card. She knew she needed to make more in less time, as well as cut her monthly expenses. She viewed the problem from the Unique Perspective of her children. Her little girls wanted to see more of their mom and she knew it would require her to work smarter, not harder. 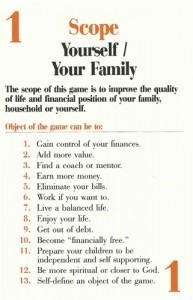 To solve the problem, she selected two solutions cards – Determine Ideal Future and Get Out of Debt cards. In order for that to happen in ten years, she would have to be consumer debt-free within five years. Currently, she owed $32,000 and had been making monthly payments of $1,000. When these bills and her mortgage get paid off, her monthly bills would be $850! Suddenly the future seemed possible, but how could she retire those debts? $350 for her car. She still owed about $10,000 at 10 percent interest. $250 for minimum payments on five VISA bills she amassed while going through her divorce. When one card was maxed out, she got another. Then another, and so on. Within two years, she owed about $11,000 on five cards. She cut up the cards about a year ago, but wasn’t making much progress in paying them off. The author suggested to call the companies and negotiate a lower interest rate (she was paying 18 percent) and all but one agreed, lowering her average rate to 11 percent. $150 went to pay down $10,000 in college loans at 6 percent. $250 went to her oldest daughter’s dental bills. She still owed $1,000. Dental Bill $ 1,000 0.00% $250 $250 4 mos. Credit Cards $11,000 11.00% $250 $500 26 mos. Car Loan $10,000 10.00% $350 $850 1 mo. $32,000 43% $1,000 $1,000 38 mos. Anna agreed to put any major purchases on hold for a while. As soon as the dental bill was paid off, Anna would pay the $250 to her VISA cards, for a total monthly payment of $500. As soon as the five VISA cards were paid, she would pay $850 to her car loan. As soon as her car was paid, she would pay $1,000 to her education loans. In 38 months, when the educational loan was paid, she would increase her mortgage payment to $1,540. Six years and two months from now she would be entirely out of debt, even without a wage increase! Now Anna was getting very excited! She could see the light at the end of the tunnel! At a 10 percent rate of return, * if she saved the $1,650 for the remaining three years and ten months of her ten year plan, her savings account would grow to almost$50,000, even after replacing her car six years into her plan. Her 401k would grow to $139,000, assuming a three percent wage increase and ten percent annual rate of return, in ten years. In total, her savings and 401k would be worth $189,000. At a ten percent rate of return, that would give her more than she has to spend now, except that she WON’T HAVE TO WORK! For the three year goals to be achieved, she need to earn more now from her main job, and do it in less time. She realized that after the cost of child care, she made VERY little in her part-time job, so she quit and spent the additional time with her girls. Her insurance sales went up as she hit the pavement with a crystal clear vision of her bright future. Not surprisingly, she made more money within her time constraints. It has been almost 12 months since Anna set up her plan. Even though she had some unexpected expenses, she is already six months ahead of schedule. Go Anna! Anna is a textbook example of a prisoner of debt. In 2000, 150,000 Americans under the age of 25 filed for bankruptcy, according to “Making the Case for Financial Literacy,” www.Jump$tartCoalition.org. The total number of household bankruptcies in 2003 was $1.6 million, according to a National Public Radio announcement, January 29, 2003. These numbers are so high, that Congress has passed tougher laws to protect creditors. These laws went into effect toward the end of 2005. “Bank credit card debt more than doubled from 1994 to 2001, reaching a high of $602.6 billion. In the same year, credit card delinquencies rose to 3.93% of all accounts in the second quarter, the highest since 1980. In addition, 4.63% of homeowners were at least 30 days behind on mortgage payments, a nine-year high. In 2000, those who sought help from credit counseling firms carried debt that, on average, accounted for 88% of their income,” according to USA Today, (October 12, 2001). The interest paid on credit card debt was $50 billion in 2001. Their chains are invisible, but millions of Americans are prisoners of debt. Debt is a major factor in divorce. Of the one million who divorce each year, 80% do so because of financial reasons, according to Jesse Jackson’s book, It’s About the Money. Debt also drives 25-30 year olds back home to their parents. In 2000, nearly four million of these “boomerang kids,” or 10.5% of 25-34 year olds were living with their parents, and many more were planning to. (AARP, Dec, 2001) According toMonstertrak.com, December 2001, 60% of college students plan to move back home after graduation. Credit Card Debt: Usually at an interest rate of 18% to 21%. Wedding Debt: Like Anna, millions of young people splurge on a wedding they can’t afford, and go into debt to pay for it. According to the Conde Nast Bridal Group, the average wedding in 2015 is $31,213. Child-Debt: Within a year or two, the newlyweds have their first baby, not realizing what is in store. The average cost of raising a child born in 2013 up until age 18 for a middle-income family in the U.S. is approximately $245,340 (or $304,480, adjusted for projected inflation). Soon the child is a teenager, and is a bigger drain on family income. Then, just when the parents are making ends meet, it’s time for college. Weary parents find life is flying by faster than they can meet its demands; bills keep mounting and children keep growing. The older they get, the more expensive it becomes to take care of them. Then, when it’s time to leave, they stay at home until age 30, living and eating free, assuming that housework is a mystical ritual, ordained by the gods for parents only. In the movie, Mr. Holland’s Opus, Mr. Holland, a talented professional musician and composer, said that he took a job as a high school band director just to get by for a while and suddenly 20 years had passed. It’s the same with parents. Time slips by, the children are grown, one’s hair is gray, one’s billfold is empty, and one’s debts are substantial. Seth, like Mr. Holland, had no interest in money or material things, and became a perpetual graduate student. When his girlfriend said she was pregnant, they decided to get married. Then three more children came quicker than Seth could have ever imagined. Years passed in minutes, and Seth found himself the father of three girls in college. To make ends meet, he worked 18 hour days—one full-time, and one part-time jobs. At age 68, he still works full-time, moonlights on weekends, and is still in debt. Like Seth, 93% of senior citizens are not solvent, and their average income in retirement is f $31,742 for people age 65 and older in 2012, according to a recent AARP Public Policy Institute analysis of Census Bureau data. In January, start putting money aside for Christmas, in savings, or in a Christmas club account. Shop all year round for Christmas presents. It takes discipline, but it can be done. Some of the best buys can be found in January. Don’t use department store credit cards; their interest rates usually are higher—between 18% and 21%. Shop around for the lowest credit card interest rates—the best rates are—single digit. Set a budget for Christmas, and stick to it. Credit cards are one of the surest ways to pile up debt. Because they’re one of the most lucrative sources of profit for banks, their pursuit of this market is sometimes ruthless and obscene. Not only do credit card companies hound college students with unparalleled solicitations, they scheme with some colleges who sell the names of their students. 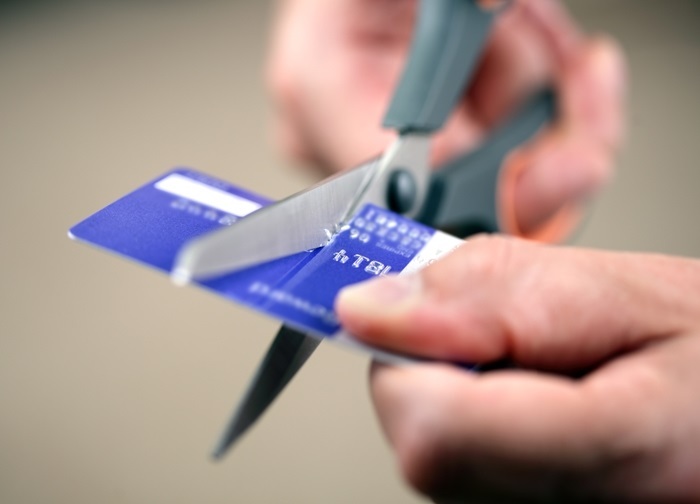 The best defense against credit card abuse it to cut up the cards when they come. This is hard to do because they’re so convenient, and they appeal to the ego. Also, marketers give them irresistible names and colors like silver, platinum, gold, and titanium. Brett Machtig has credit card cutting ceremonies when he speaks on college campuses. While credit cards can be a trap, our society is so sophisticated that at least one credit card is needed. The best way to use it is to buy only what you know you can pay off at the end of the month. Let’s assume you use your credit card to buy a $1000 piece of jewelry for Christmas. If your interest rate is 18%, as it is for most young people, your first statement will say that your minimum payment is $20 . If you pay off the $1000 at the minimum rate, it will take you 90 months (7 ½ years), and you’ll about $800 in interest, which means your $1000 purchase to cost you $1,800. Suppose you used your credit card to buy a $500 television set as a Christmas present. If you paid the minimum payment, it will take 66 months (5 ½ years), and you’ll pay an extra $159 in interest. Unaware people spend their lives paying interest on loans. Aware people receive interest on their investments. A wise card to have is the bank debit card. It looks like a credit card, and functions like one, except the money is drawn directly from your bank account. The debit card is an ideal replacement for your credit card, and is a godsend for those who write bad checks each month. Debt is an American way of life. It is also a monster. It takes a lot of discipline and time to pay off debts. Even with help from a financial counseling agency, it can take seven years to get out of debt. 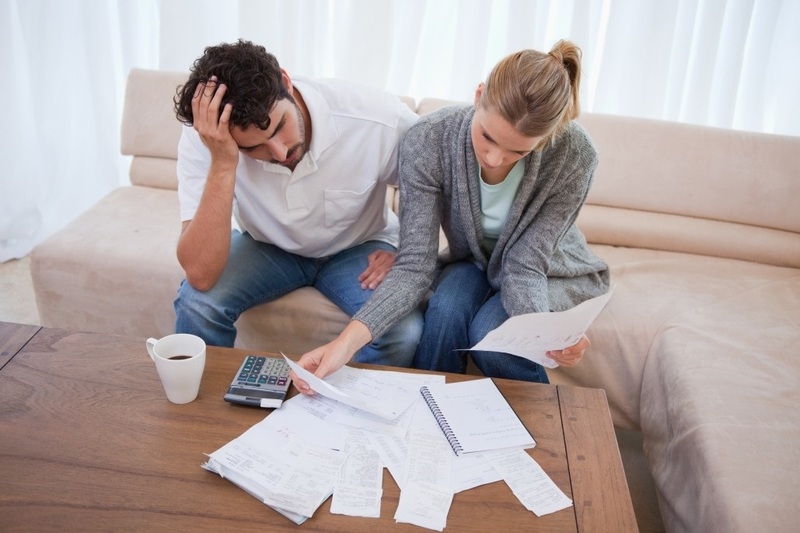 Go after your most stressful debts first, then short-term debts, and high-interest rate debts. List yours, but don’t include home mortgage, low-interest loans, and most car loans. What average interest rate are you paying, 9%, 15%, 21%? To figure out how much you have on hand to pay off these debts, each year figure the minimum payment you make on each loan, plus interest. Divide the payments from question 4 above, by the total debt from question 2, and multiply by 1000. On the Debt Payoff Planner chart below, find the approximate number of months required to pay off your debt. Work with the chart and your budget, until you find a payment schedule you can live with. Increase your monthly payment to the amount you show in question 7. Pay off the highest rate loans first, and maintain at least minimum payments on all other loans, which doesn’t change the total months to pay off all debts. 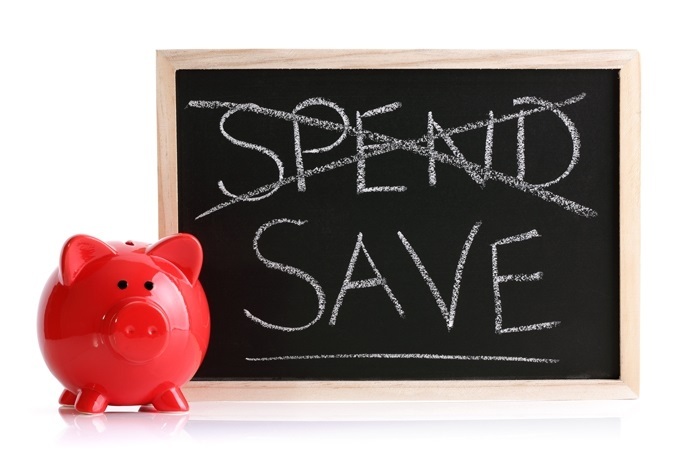 As you reduce your debts, turn the money you would have spent, back to yourself by putting it into your savings. List your debts and use the table to create a payoff schedule. 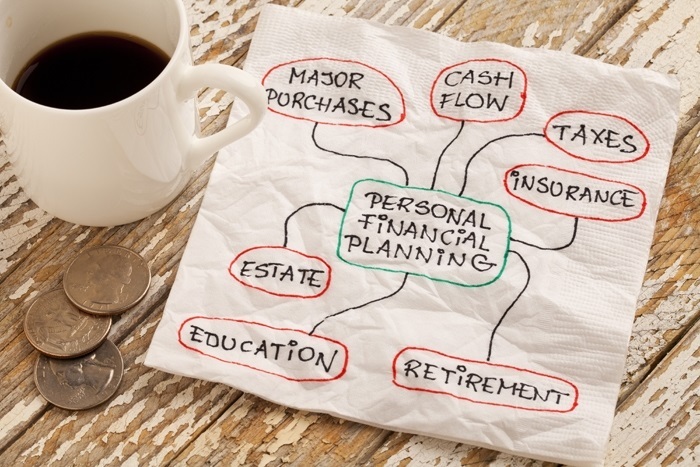 Maximize your 401K program, which means putting about 15% of your income into the plan. Live on 85% of the take-home pay you have, after the 15% for your 401K has been deducted from your check. Because you’re living on 85% of your take home pay, you now have 15% to make additional payments to your debts. List your five top debts—those with highest interest rates, or the most stressful. Select the one you want to pay off first, and add the 15% of your income to the regular payment, while making the regular payments on your other debts. When this first of the five debts is paid, go the next one, adding 15% you saved from your paycheck to the regular payment, plus the amount you had been paying on the debt that is now paid off. (To illustrate, let’s assume that you’ve paid off the first of the five debts. Now select the next of the remaining four that you want to pay off. Let us say that your regular payment of this debt is $200, and that the payment of the old debt was $150 a month. Add $150 you’re no longer paying to the $200 regular payment, amounting to $350 . To this, add the 15% you save from each paycheck, let’s say $300. Now your total payment is $200 + $150+$300= $650 to pay, instead of the normal payment of $200. Repeat this procedure for the remaining debts, remembering that you cannot save until you get out of debt. An additional source of funds to pay toward debts is your yearly raise or bonus. If possible, pay your debts with whatever you earn in raises. If it’s not possible, use at least half of your raise. Later, when debts are paid, you can put each raise into investments. Don’t be casual; arrange an automatic transfer of the raise directly into a savings or investment account—it’s effortless and you won’t miss the money. It’s time to apply what you learned above to your present situation. Below is a chart for you to list your debts. Below that is a debt payoff planner that will help you set up a timetable for becoming debt free. in this many months $20 63mos. 79mos. 120mos. For example, if you owe $15,000 at 9% and you want to pay it off in two years, follow the 9% column down to 24 months: =$45 x 15(thousand)= $675/mo. We began this article with the story of Anna, a bankrupt, boomerang kid whose life seemed hopeless when she moved back home with her mother. However, sometimes hard times can have a positive effect. Anna’s troubles caused her to become a responsible, hard-working, serious adult. With her mother’s help, she returned to college and graduated with honors. She went on to graduate school and completed a Master’s degree in one year. She and her husband, who live 1000 miles from her mother, now have a combined income of $85,000. They are paying off debts, and building a future for themselves. Answer to the Question: How can you avoid the slippery slope of debt? Even though huge debts are part of the American way of life, refuse to join the crowd. Refuse to go into debt for your wedding. Refuse to buy now, and pay later for things you can get along without. Keep just one credit card, and cut up the rest, being sure to pay off the balances each month. Work 20 hours a week while in college. This will enable you to lower or eliminate student loan debt. Use the Ortalda plan to pay off all debts within three years.